These thermal pads are very useful to compensate height differences and other irregularities on coolers and surfaces that are to be cooled. Due to the very elastic adaptability and the low hardness of this pad only little contact pressure is needed to allow perfect adaptation to the surfaces to ensure the best possible heat transfer. With these pads almost any unevenness can be compensated, from microscopically small grooves to visible irregularities. The self-adhesive surface of these pads allow easy installation and prevents the pad from shifting during installation of the cooler. 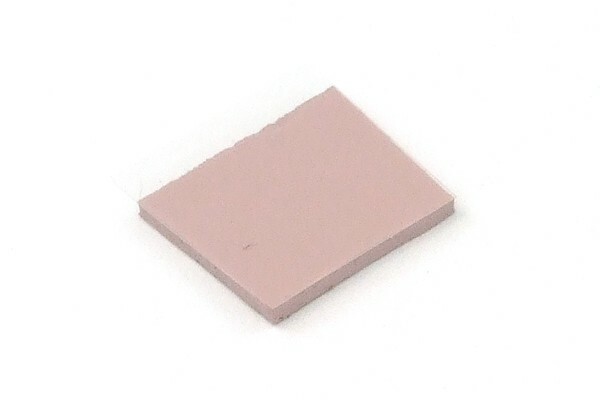 These pads can be cut to any desired size and are therefore suitable for just about any application: From VRAM coolers on graphics cards to VRM blocks on the motherboard. Even large components such as the North- or Southbridge can be equipped with these pads, as they have excellent heat conductivity. With their many uses, these thermal pads should be amongst any PC-builder's equipment. Note: The thermal pads can be compressed to up to half of their height.